The Quinnipiac Bobcats men's ice hockey team picked up its second commitment of the week for the 2018-2019 season, this time in 1997 Dutch born forward Guus van Nes who is currently playing for the Boston Jr. Bruins of the NCDC. Listed at 6'3, 190 pounds, the left shot van Nes is the first Dutch born player to play for Quinnipiac since former Bobcats defenseman Mike Dalhuisen who played for Quinnipiac from the 2009-2010 season to the 2012-2013 season when he was part of the first Frozen Four team in school history. In 19 games played this season, van Nes has 18 points (5 goals, 13 assists) with 24 penalty minutes. 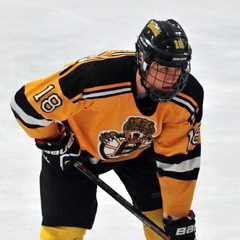 van Nes has been with the Jr. Bruins program for the previous three seasons prior to this one as he was a member of the U-18 team in 2014-15 and the Premier team in the 2015-16 and 2016-17 seasons. He has international experience with the Netherlands U-18 and U-20 national teams in the past. He brings size up front for the Bobcats along with some skill as well. Below is a link to some youtube highlights of van Nes. Congrats to Guus and welcome to BobcatNation.